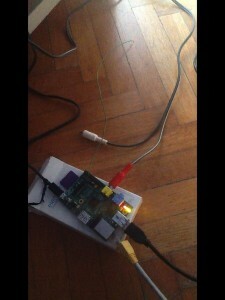 Another Raspberry Pi project: how to turn RPi into an FM transmitter? Imperial College Robotics Society released this Python code that streams a simple (44.1 KHz, mono, 16 bit) audio WAV file into FM. With a 20 cm wire, transmission signal will be weak if the radio is not in the nearby, let’s say one meter radius. Check with other frequencies too: just change the figure in the command line (e.g. : sudo ./pifm sound.wav 95.5 for 95.5 MHz) but don’t expect it to be too accurate! Note: when connecting the wire do it very carefully: check the right pin, check that the wire doesn’t short-contact any other GPIO pin, and do it with the RPi switched off! This entry was posted in Computer, Creativity, Digital life, E-learning, Educational, Electronics, Geekery, Hacking, Hardware, Ideas, Maker, Raspberry Pi, Twitter, Vine and tagged electronics, FM transmitter, hacking, Imperial College, Python, Raspberry PI. Bookmark the permalink.